You might be surprised by the chic modernity of the entrance. A few years ago, this collection of fine old buildings underwent a vast restoration, so now you enter the new ‘join’ between the two main structures. Through glass doors a wide, uncluttered corridor will lead you to a spacious hallway with a glass roof. To the left, is the terrace restaurant overlooking the Canal (which has the technological wizardry to allow dining al fresco, even in cold weather), and, to the right, a wonderful, dark, Wizard of Oz tunnel, leads to the lifts to the bedrooms. Checking in was no chore for me, for the members of staff at the Reception desk were efficient and friendly – and, indeed, were careful to use my name throughout my stay, a small courtesy which I appreciated. (The General Manager, Gabriele Marchiori, heads an excellent team.) Then I set off to follow the Yellow Brick Road. Room 305 was on the third floor. 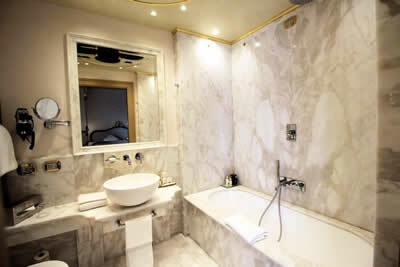 It was the Valaresso Suite (which can cost up to 5,000€ a night for two, depending upon the season). This was blissfully quiet and comfortable accommodation. Oak floors, gilt-framed paintings and light fittings of Murano crystal created the sense of luxury appreciated by your correspondent. The door from the corridor opened into the sitting room, with its writing desk and easy chairs in gold velvet. Within the fitted wardrobes was that essential item for today’s traveller – the private safe. An archway led into the bedroom, where the bed had been made deliciously soft for my ailing back. And then a sliding door revealed the bathroom, a chamber of white marble, spotlights, two wash basins, a good bath tub, a walk-in shower, a loo and a bidet. I have mentioned the union of two ancient buildings. But I must be more precise. 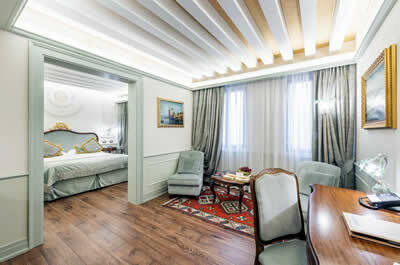 The hotel is really a marriage of two palaces: the Palazzetto Vallaresso Erizzo and the Palazzo Dandolo. In 1638 the latter was turned into the world’s first public casino. It survived as such until opponents had it closed in 1774. Thereafter it was used for dancing and theatricals, until its resurrection as an hotel. This means that you can find on the first floor the magnificent chamber where all the fun happened. 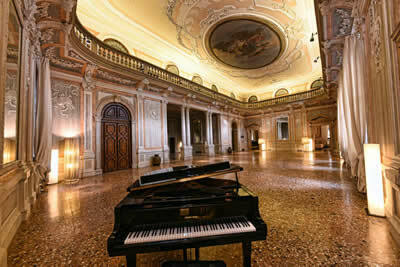 It is the Sala del Ridotto (rough translation: the Withdrawing Room), and you should certainly seek out this Venetian gem, for it is a huge hall of stuccoes, marbles and frescoes (by artists of the stature of Tiepolo, Guardi and Bella). 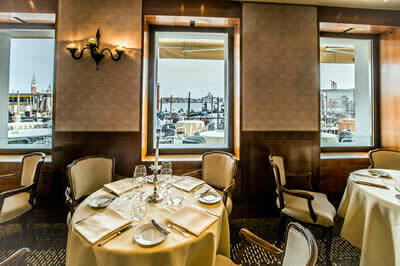 The hotel’s dining room, the Grand Canal Restaurant, is one of the most highly regarded in Venice. 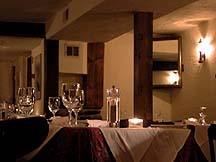 Here Chef Sandro Traini sends out to the tables (in its small connected rooms and on its long terrace) dishes which are based on first-class ingredients, expert culinary technique and Italian gastronomic tradition. You will enjoy eating here. I certainly did. My dinner began with a delicate combination of scallops with black truffle and topinambur (artichoke) sauce. Then it scaled the heights with magnificent lobster ravioli with burrata cheese and broccoli. This was a confection truly gorgeous in all its aspects. Next it was good, pink rack of lamb, carved by the table, and the finale was a rich and pleasing rum and tangerine savarin. (Expect to pay around 95€ for four such courses.) Service here is formal, correct and attentive. I was pleased to note that napkins were replaced when guests left the table for a moment. 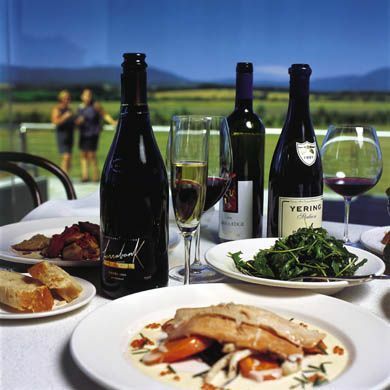 The wine list has 128 offerings from Italy and France. Prices are friendly, and run from 25€ for Roccat prosecco to 322€ for the 2011 vintage of Mr Gaja’s barbaresco. I am always cheered to see a German sweet wine on a list, and here it is a riesling auslese from Clemens Busch (127€, half). Other bottles to catch my eye were: Krug Grande Cuvée (295€), 2009 Cristal (246€), 2014 Ornellaia (250€), 2012 Tignanello (167€), 2012 Sassicaia (300€) and 2000 Yquem (267€, half). Poured into the good Schott glasses for me were a lovely, full-bodied chardonnay (Jurosa, 2015 – 40€) and a dense, dark cabernet sauvignon with some residual sweetness (Brentino di Breganze, Maculan, 2015 – 40€). 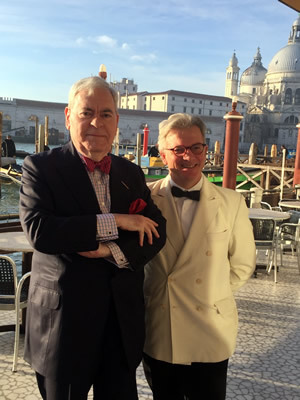 Each morning I returned to the restaurant to break my fast while gazing over the waters of the Grand Canal and being looked after with exemplary kindness by Maitre d’ Patrizio Stoppa (pictured). From the buffet I secured particularly good brioche and slices of indulgent chocolate mousse cake, as well as dishes of pineapple, orange and kiwi and plates of bacon, mushrooms and tomatoes. One should always leave the breakfast table having slightly over-eaten. 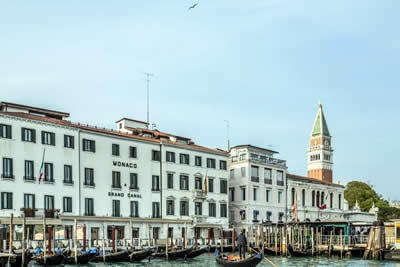 And one should always make sure your hotel in Venice has a good location. That is why – along with its comfortable accommodation, fine service and delicious food – I am very happy indeed to recommend the Hotel Monaco & Grand Hotel.